Founded by Alexandre Beauregard and based in Geneva, Beauregard brings watchmaking and jewellery together in an entirely new way, offering exceptional Swiss timepieces of highly original design, set with sublime stones that are hand-handcrafted in its Montreal atelier. These watches are the fruit of a passionate project that goes beyond making a watch, in a process that is closer to the work of an artist. 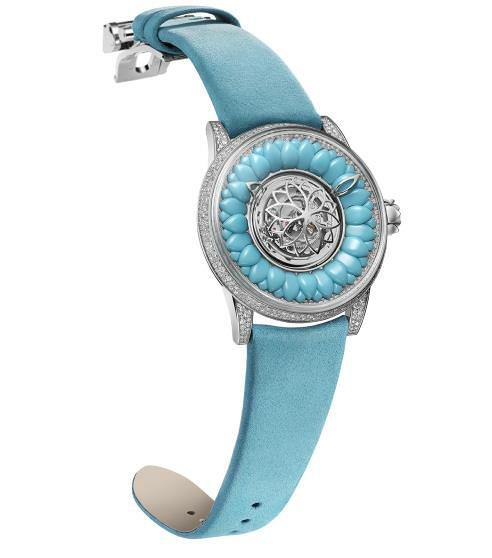 Distinctive, contemporary and unquestionably precious, BEAUREGARD’s watches are offered as pièces uniques. The genesis of Beauregard was a desire to create a bridge between horology and jewellery, while trying to defy obvious paths and traditional conventions. To find a new and original expression balanced by keen awareness of the past, something timeless and yet utterly contemporary, underpinned by a profound respect for craftsmanship. A beautiful object with a useful function, a reminder that time is truly precious. A garden in high summer: a riot of colour, plants overflowing their borders, a sense of joy, nature in celebration. And amid the profusion, dahlias, strong and elegant, with their flowers sophisticated and sumptuous. This first collection of watches pays tribute to the dahlia, which, in the language of plants, symbolises dignity and elegance – qualities that are central to Beauregard’s ethos. The design of the watch carries a strong imprint of the flower: substantial yet delicate, its complex layers of petals creating strength and volume, the dahlia has a singular and timeless beauty that lends itself naturally to Beauregard’s fresh and contemporary elegance.